당신은 페이지의 상단에있는 '스포일러' 탭에서 스포일러를 제외하고 볼 수 있습니다. 또는 스포일러를 강조하여 볼 수 있습니다. 좋아. 봐봐. 우리 둘 다 네가 후회할 말들을 많이 했었지. 그런데 나는 우리의 갈등을 제쳐놓아야 한다고 봐. 과학을 위해서 말이지. 이 괴물아. 포털 2는 밸브사에 의해 개발된 포털의 후속작입니다. It features a single-player story set after the events of Portal's story; and a brand-new Co-op game mode, featuring additional test chambers designed specifically for Co-operative play. Portal 2 was released April 19, 2011 on the Steam platform. Retail release in North America started on April 19, 2011; and later, Europe and Australia on April 21, 2011. 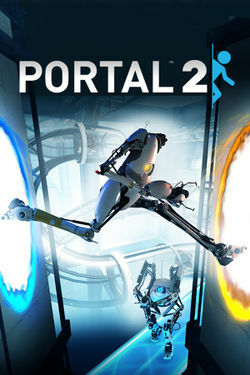 Portal 2 takes place an indeterminate amount of time after the events of Portal, which saw Chell destroying the sentient computer GLaDOS, and landing outside the facility, only to be dragged back inside of Aperture Science where she was ultimately placed in a Relaxation Chamber by Doug Rattmann for the indefinite future. This page was last modified on 18 February 2017, at 03:46.